Last week, we took a look back at what 2011 offered in terms of the best overall credit card offers. This week, we’re expanding our effort to provide you with a few of the better secured credit card offers of the past year. It’s safe to say this year brought big changes to the entire credit card industry. From the continued economic problems Americans faced to the sweeping changes courtesy of the 2009 CARD Act to the rapid growth of the secured credit card, this year is what they call a “game changer”. So, with that in mind, take a look at some of these secured credit card offers that meet the demands we have for credit cards without the excessive fees. Also, keep in mind these credit card offers are limited to a true “secured” credit card dynamic, meaning applicants are securing their credit lines with a savings account or other similar account, but do not actually use their collateral, which means your payment history is reported to the three major credit bureaus, making it a fine choice for building or rebuilding your credit history. This credit card has all the hallmarks of a classic offer, including all the security offered by the MasterCard logo. APR is currently at 14.99% and cash withdrawals have a 19.99% rate. Again, this is a secured credit card offer which means there are late payment fees and over the limit fees that come into play if you drop the ball. Further, there’s an annual fee of $35, though this is significantly less than other offers and certainly not a deal breaker for most applicants. There’s no credit check, either, which makes it a choice for anyone. Your credit limit is up to you, as long as you meet the $300 minimum limit. We like all the zeroes associated with this secured card offer. As a card holder, you’ll enjoy a fixed 0% APR that never changes – even if you’re late with a payment. There are no application fees, no annual fees and no worries about fraud or theft, thanks to the protection program offered on this Visa. That said, there is a $9.95 monthly maintenance fee. But you’ll rest easy knowing your on-time payments are reported without delay to the three credit bureaus, ensuring a faster return to higher credit scores. This is one of the newer secured credit cards introduced in 2011, but already, it’s gaining a lot of attention; not to mention consumers who are pleased with this product. One of the bigger perks associated with the Onyx secured offer is the complimentary airline tickets and other gifts, such as iPods and free long distance. The key to ensuring this is the right card for your needs is to closely review the terms and conditions associated with the Onyx. There are many perks, including up to a $5,000 credit limit. Many offers limit the max credit lines at $3,000, making the Onyx’s higher limit a better choice for many consumers. 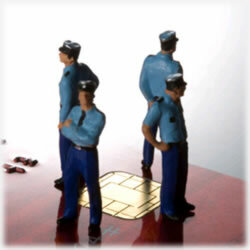 It too provides a quick turnaround in terms of its reporting to the three credit bureaus. Again, and though it’s a newer offer, it looks as though this is quickly becoming a formidable offer in the secured credit card pool. This one makes our list because of the simplicity of its offer. No credit check (though it does report to all three bureaus), a high introductory savings rate and you can have up to a $5000 credit limit based on your deposits. There are many complimentary benefits, including travel accident and auto rental insurance. There’s a $59 annual fee, though when compared to other offers, this is more than reasonable for many consumers. It’s certainly worthy of our annual listing and your consideration, too. As always, these are just a few of the many secured credit card offers that prove this particular sector most certainly has a market – and one that continues to grow. The terms and conditions for any offer requires a few minutes of your time – but they’re always well spent and can help ensure you’re making the best choice for your needs.